I had a hankerin' for some ribs last weekend, but I wanted something a little off the beaten path. Included in my craving was the yearning for something sweet and spicy. This recipe is the result of some early morning category-one brainstorming. A few ideas rattled around in my brain and I eventually decided to use my Finger Stickin' Chicken Sauce as the base to which I'd add an Asian flair. The chicken sauce certainly has the sweet and spicy nailed, so I simply added some hoisin sauce to add the Asian persuasion, and a little Sriracha to kick the heat up a little bit. Note: If you have a favorite method for smoking/grilling your baby back ribs, use that with this rub and sauce. There's no need to cook the ribs the way I did. Also, you can certainly roast the ribs in an oven, but you may have to adjust the cook time. About 4 hours before you want to serve, start your smoker or grill and prepare for indirect cooking over a medium fire (275-300º). I cooked over straight Kingsford Original briquets with no smoke wood. Combine the rub ingredients in a small mixing bowl and whisk well until all of the ingredients are combined. Season both sides of each slab of ribs evenly with the rub. I put more on the meat side than the bone side. Note: You can season the ribs ahead of time, but no more than an hour before you're ready to start cooking. Smoke/grill the ribs indirect until a toothpick inserted between the bones has very little resistance. The cook time is approximately 3 hours at an average temperature of 300º. However, every hog and cooker is different, so use the timing as merely a guideline. The toothpick test is your friend. 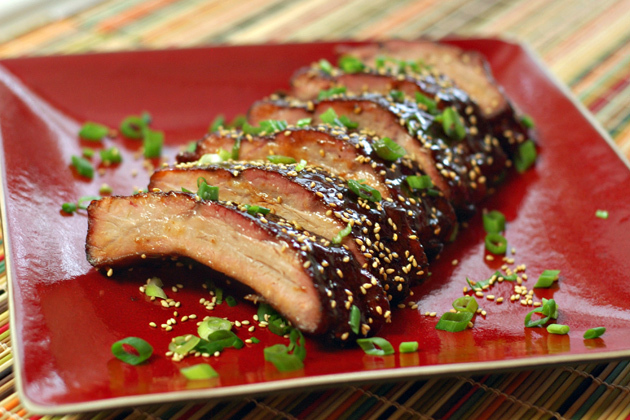 While the ribs are cooking, make the glaze. Follow the instructions for the Finger Stickin' Chicken Sauce then whisk in the remaining ingredients at the end. Remove from the heat and set aside. 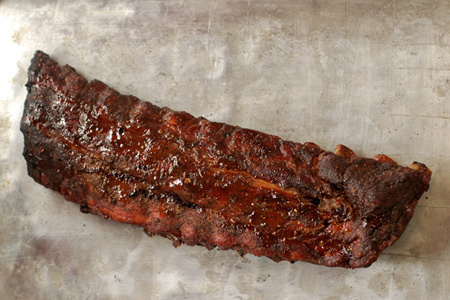 Remove the ribs from the cooker and coat both sides of each slab with a light coating of the glaze. Return the ribs to the grill/smoker and cook indirect another 10 minutes. Pay close attention because the glaze will burn easily. You just want it to caramelize slightly. 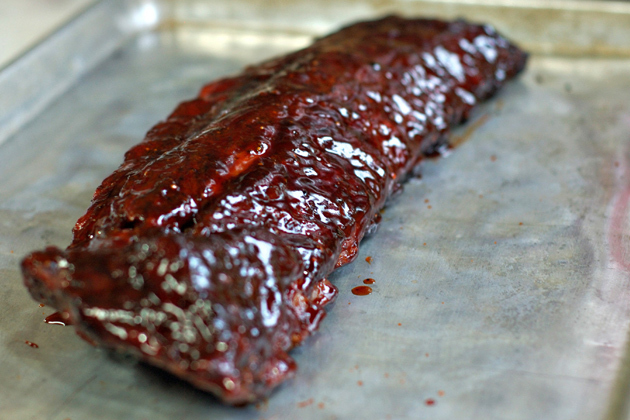 Remove the ribs from the cooker and coat both sides of each slab with a generous coating of the glaze. Cut the ribs between the bones, then plate and sprinkle with sesame seeds and sliced green onion for garnish. Note: I cooked the ribs in my Pit Barrel Cooker. 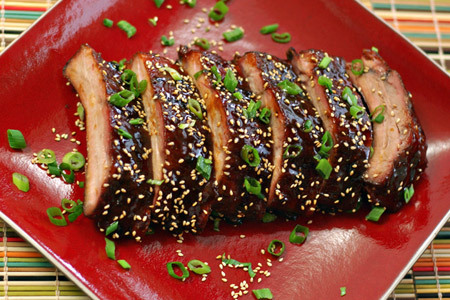 These look great, John, and I like the quick and easy way you added the Asian flair to a basic bbq sauce. Me? Nah! I'd never darken the virtual door of that place! :-P Thanks, as always Chris. I love Asian favors in BBQ and this looks great. Goin to have to try this John. May I suggest a nice Asian Slaw as a side? I developed this for my pp egg rolls. You can substitute Mirin for the vinegar and I add chopped peanuts when I serve as a side. Mmmmm good. I just wanted to say THANK YOU for such a great recipe. I originally came to your website after searching for Turkey recipes and brines (which I definitely plan on using!). I stumbled upon numerous recipes that I was interested in making. Well, I made this recipe for my wife with baby back style ribs...and she LOVED them. She was raving about how good they were and she really enjoyed the Asian flavor/theme. It should be noted that I cooked them in my oven (I'm between moving, so the UDS was not able to be used) @ 250 degrees for approximately 3 hours. I followed your instructions on basting with 10 minutes left and the sauce was perfectly caramelized. I reapplied once more after they came out of the oven and it was GAME OVER. The house smelled great, too. Thanks again, John! Great recipe! Oh, try the Asian glaze on some chicken wings sometime. How do I prepare this recipe on the OptiGrill? Bridget - You can't, they take far too long to cook and T-fal recommends against cooking meat with bones on the OptiGrill. Thanks for the suggestion!! I made an Asian Cole slaw and it was delicious with the ribs!!! Mzdebbielove - I'm so glad that you enjoyed them!